The first mention, that I have found, on the Pipifax Bitters is the 1870 filing of Max Walter for the trademark. October of 1871 saw the height of newspaper advertising for the Pipifax Bitters. In October of 1872 Shaeffer Walter & Co. run an advertisement that they have sold their entire stock of bitters to J.M. Goewey & Co. I am assuming that (yea, I’m out on a limb) Goewey & Co have bought the stock and not the right to manufacture the product. In December of 1872 the firm of Engel & Hass takes over the “agency” of Shaeffer Walter & Co. and are advertising for the patronage of liquor dealers and the general public. By April of 1873 J.M. Goewey & Co. are sole proprietors of the Pipifax brand (I believe this means they own the rights to manufacture and sell the Pipifax product.) and begin a major newspaper advertising campaign. Goewey & Co. continue to advertise in several newspapers that they are the sole proprietors and have for sale Pipifax Bitters until March of 1875 when all mention of the company and the product stops. 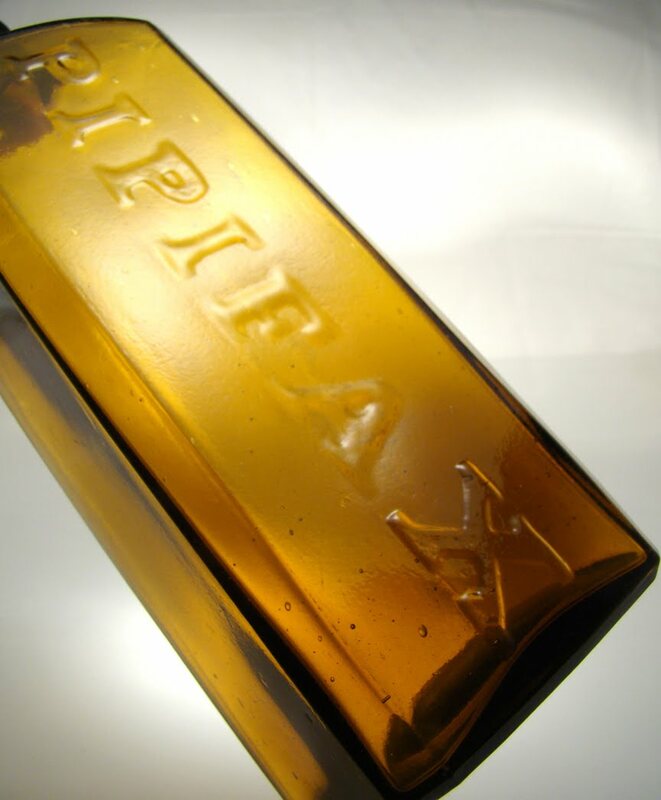 The Pipifax bottle comes with an applied and tooled top (thanks Richard S) and although it does not have the word BITTERS embossed in the glass all the advertisements I have seen refer to it as a bitters. Pipifax was used to promote digestion, stimulate the stomach and restore the appetite, all ailments that bitters manufacturers claimed their products cured. "Pipifax" meaning something of minor significance or complexity. "Die Aufgabe ist doch Pipifax"-"That exercise is a peace of cake", "Ach was die reden is doch alles Pipifax"-"Let them talk, it's not like they're actually saying anything"
It also comes with a tooled top. Just came across this article for the first time. In 2004(?) we dug a two-hole privy in Yuma AZ behind and old Barber Shop and Saloon building that was removed decades ago. It yielded exactly 12 PIPIFAX bottles, 9 of them broken, 3 in very good condition. Yuma was a poor town, most stuff found here is unembossed and badly stained, but this hole was an incredible dig for here, also yielding AFRICAN STOMACH BITTERS, a broken DRAKE'S, HOSTETTER'S, unembossed hutchinsons (a rare find here) and the saddest one of all....a broken TEACUP WHISKEY! Tons of unembossed black-glass beers and pumpkin seed flasks came out as well, but not a single YUMA embossed bottle! The cool thing about the PIPIFAX was that there were 3 nice, intact ones, and there just happened to be 3 of us digging...making dividing them up rather easy! Another Great Article Rick, I sold mine a long time ago and just this year got another one, Happy New Years.